Hailing from Canada by way of Australia, Brian Campeau is somewhat of a pariah in the folk world. He does a lot with a little, mostly thanks to his superb command of songwriting and composition. Armed primarily with an acoustic guitar and a versatile voice, a lot of his music trends toward pensive and weighty. 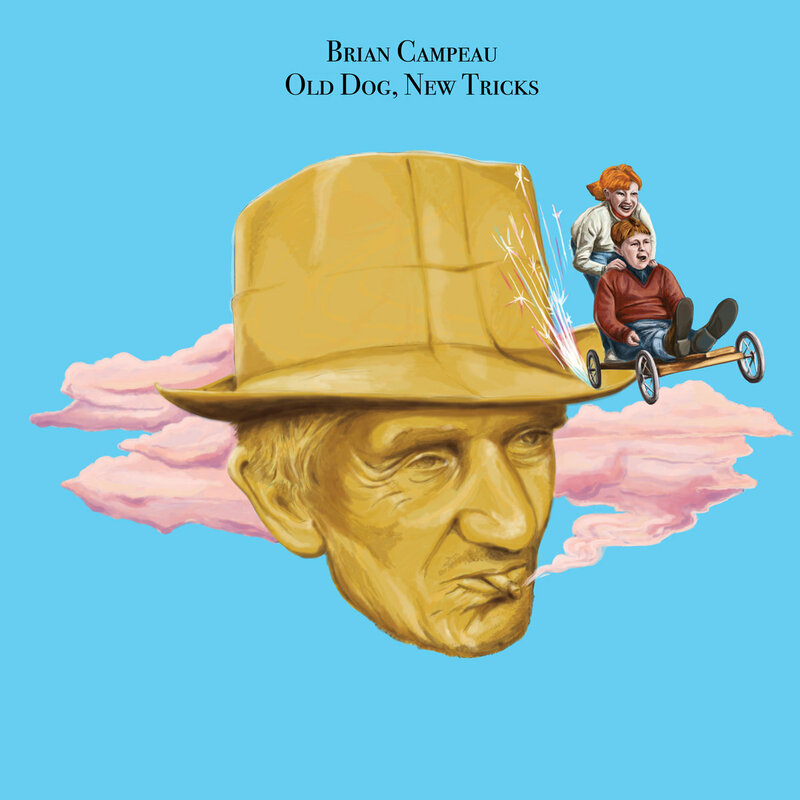 Here with Old Dog, New Tricks, he proves the classic root idiom wrong, showing that stepping back as an old dog and approaching from a lighter, ethereal approach with new tricks can produce music of equal or great artistic value without losing that emotional weight. Though I find much of Campeau‘s past work endearing, it never grabbed me much like this new project has. I can’t positively say it’s due to this album’s lighter mood because I like dense and emotional stuff too, and he does material of that tone justice! More so, I think it’s due to his ability to take some risks here and change things up. Assisted by a number of guests and friends, Campeau leads us by the hand through a journey that touches each corner of the musical realm he inhabits without feeling disjointed or haphazard. Personality radiates from each song, and makes you feel like you know Campeau. “Losing Friends” says what we’re all thinking and already know in our late 20s and beyond: ‘Losing friends is easy/Keeping friends is hard’. Preach, Brian. That’s part of the beauty here; it feels human and candid with his musings on life, love, and more from his point-of-view that’s more calming than outright positive or happy. It’s like someone telling you ‘it’s gonna be okay‘ when things clearly aren’t. The dreamy atmosphere throughout a lot of it lends an unreal quality to it all. It’s a bit of an amalgamation of things that shouldn’t be, or at least shouldn’t be presented as well as this. The duet tracks of “We’re No Fish” and “Land We Found” with Hannah Cameron are so profoundly human, like a loving conversation with a charming pop soundtrack behind it. There’s three sequential tracks of Old Dog, New Tricks that embody the unbridled spirit and skill of Campeau. “Two Repeating” is the longest track; more of a soundscape than a song at first. Moaning strings open it up, setting a melancholy tone despite the album’s air of positivity. The song progresses and we get thoughtful guitar and vocals that take their time. It’s haunting – a great contrast to “Next October” which has a lot of pep and sunshine to it. I talked a good amount about it here when we premiered the video, but seeing it in the context of this album magnifies its purpose even more. Likewise, the next song “Slow Walking” opens with fierce bass hits, like someone knocking on the door to your subconscious. Vocals are light and airy, a snappy programmed hi-hat prominent throughout, as if keeping time in a different dimension. It’s like a heated blanket for your brain. These three middle tracks capture the magic of the album, but the magic extends well into the rest of it as well. There’s moments of psychedelia on “Done it Again”, or the intense prog rock rumblings of “Pie in the Sky” that are noteworthy, too, but I can’t give everything away, can I? Every element just smacks of great forethought. Nothing is an accident, everything fits, everything works. For the life of me, I can’t think of anything overtly wrong with this album. I relish in walking down the roads around my apartment noting the subtle early autumn changes present in the foliage, or combing through Denver’s anarchic traffic by foot as I go to or from work while Brian Campeau and his friends act as my impromptu narrators. You ever just hear an album only a couple times, but you already feel like you understand its meaning and importance to you intimately? Old Dog, New Tricks is that for me. When it comes down to it, this album is just a delight to behold. Even if you don’t subscribe to the tenets of artsy folk pop or even *~positive vibe~* endorsers like I don’t, Campeau‘s impressive writing and execution can’t be denied. Listening to this album is like swimming in perfect temperature water. It’s so inviting and soothing, and quite frankly, more people need to dip their toes into what the singer-songwriter has to offer, regardless of your tendency toward whatever preconceived notions of this music – or even his past work – that you might have. Old Dog, New Tricks is the best example of what happens when an artist plays with expectations and takes risks by expanding the scope of their art. I smile when I hear it, and sometimes that’s the most meaningful response to art. Phenomenal work. Next PostAnatomy Of The Bear - "Alysu"